The inception of the widespread taste for chinoiserie in England occurred in the 1680s as artisans of all sorts decorated their wares with fantastic ornament inspired by the art of the Far East. This exhibition, which coincides with the Milwaukee Art Museum's recent acquisition of an outstanding silver monteith bowl from the period, will explore the explosion in exotic imagery that gripped England between about 1680 and 1710. The show will also briefly address the American reception of the trend a few decades later. Media represented will include engraved silver, enameled imported porcelain and domestic stoneware, "Bleu Persan" and other delftware, embroidered textiles, and "Japanned" furniture. Many objects will be drawn from the collection of the Chipstone Foundation in Milwaukee and from additional public and private collections. This exhibition is organized by the Milwaukee Art Museum and is curated by Sarah Fayen, assistant curator at the Chipstone Foundation. London, England, "Bleu Persan" Cistern, ca. 1680. 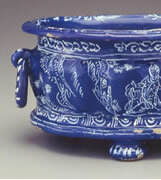 Tin-glazed earthenware. Chipstone Foundation. Photo: Gavin Ashworth.